Even though it's finally March, which is spring in my books, I spent the weekend sick as dog! I was lucky to have my awesome boyfriend Howie by my side from Friday after work to Sunday night. We tried to make the best of my soft foods diet with homemade Tortellini Soup on Friday night (and Saturday for leftovers, of course! 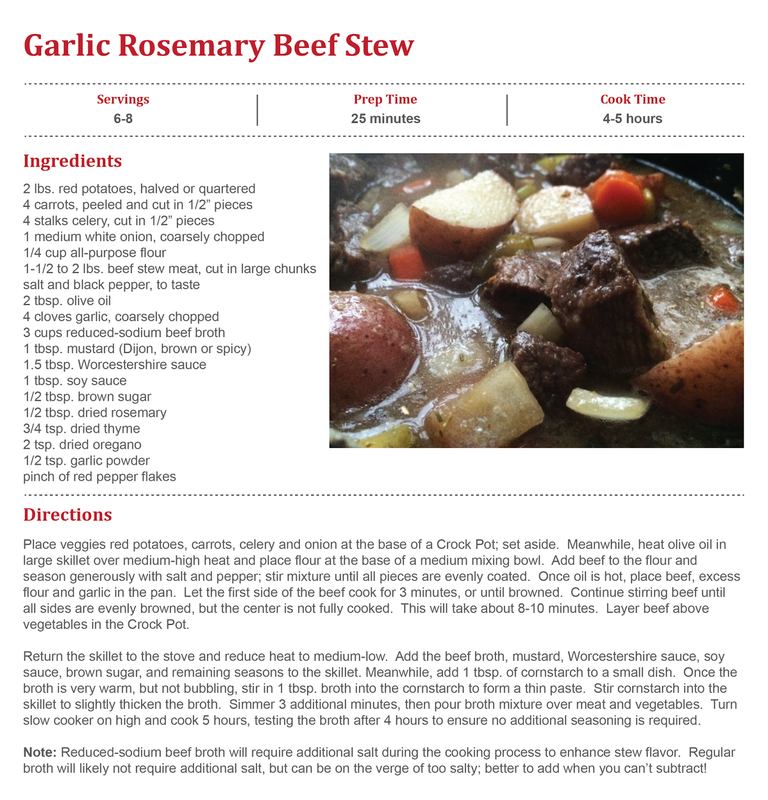 ), and and an ahhhmazing Garlic Rosemary Beef Stew on Sunday night. It was super easy to make and let us be lazy on the couch watching Maleficent and the Cavs Game all afternoon without lifting a finger...except little test tastes to get the seasoning just right! 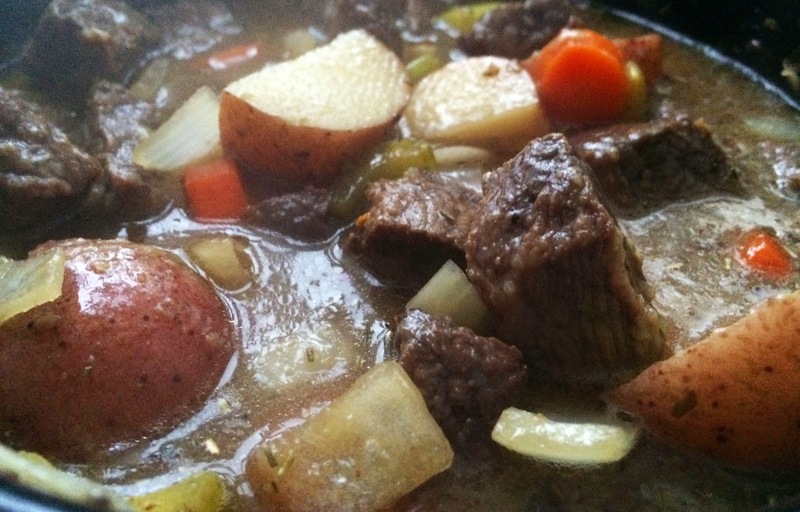 We started prepping the stew at 1:30, and everything was perfectly tender by 7:00 for dinner. YUM! I started by rinsing and chopping up 2 lbs. 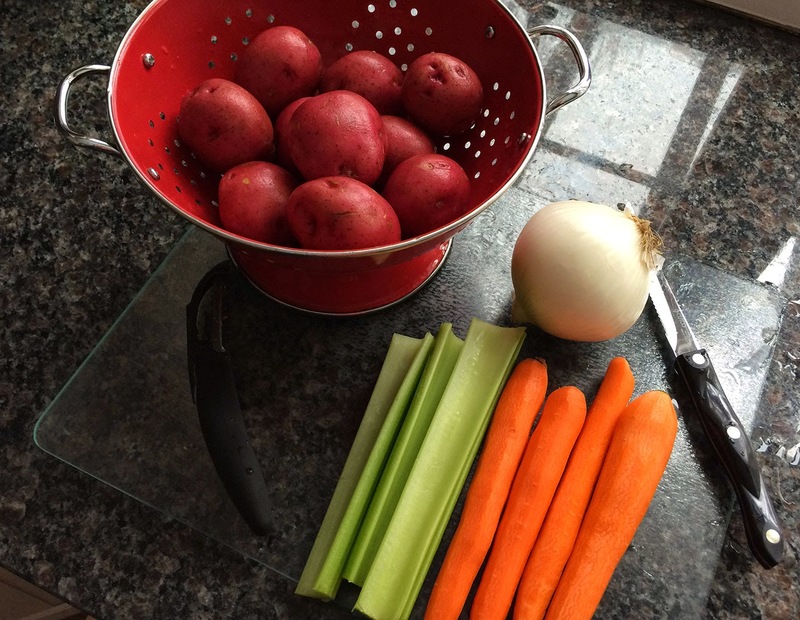 of red potatoes, 4 carrots, 4 stalks of celery and a large onion. I love how much flavor these vegetables release into the beef broth while it sits cooking all day and the flavors melt together into a perfect harmony mmmm. Now, one step into the recipe, I'm already breaking the rules of slow-cooking! I don't cook the whole thing in the slow cooker! 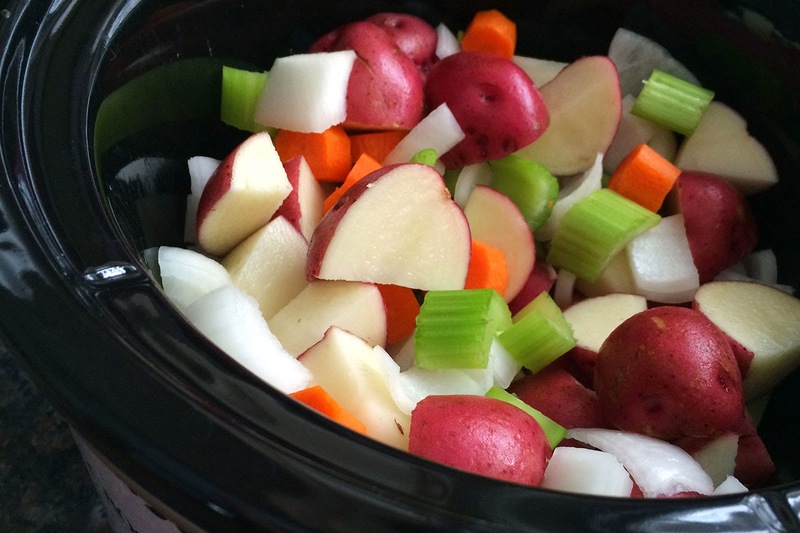 I can read your mind and you're thinking, "isn't the whole point of a slow cooker to throw the stuff in and go?!" Well I'm returning your question with a question too...how many times have you had a slow-cooker meal where everything is ultra mushy, maybe even a little disintegrated into the broth, and you can barely distinguish between the potato and the beef? My point is made. 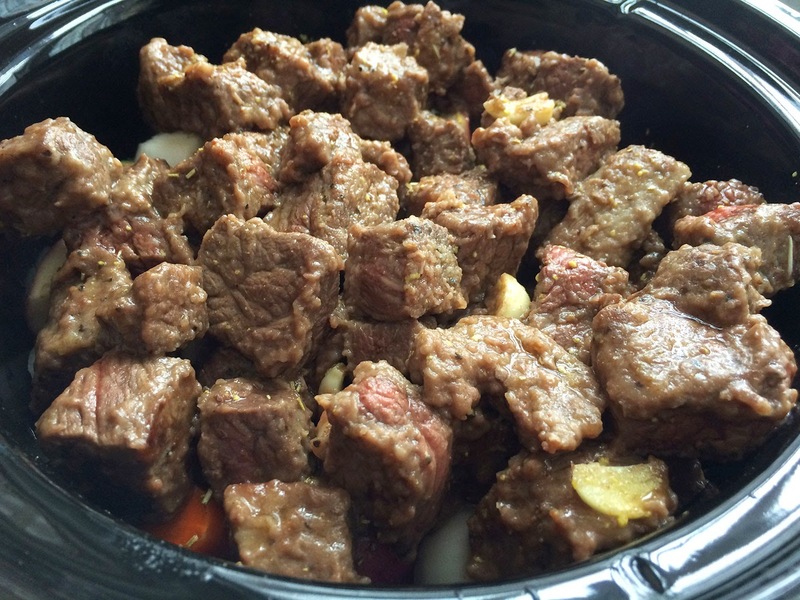 I add flour to the base of a medium mixing bowl and place the beef on top. 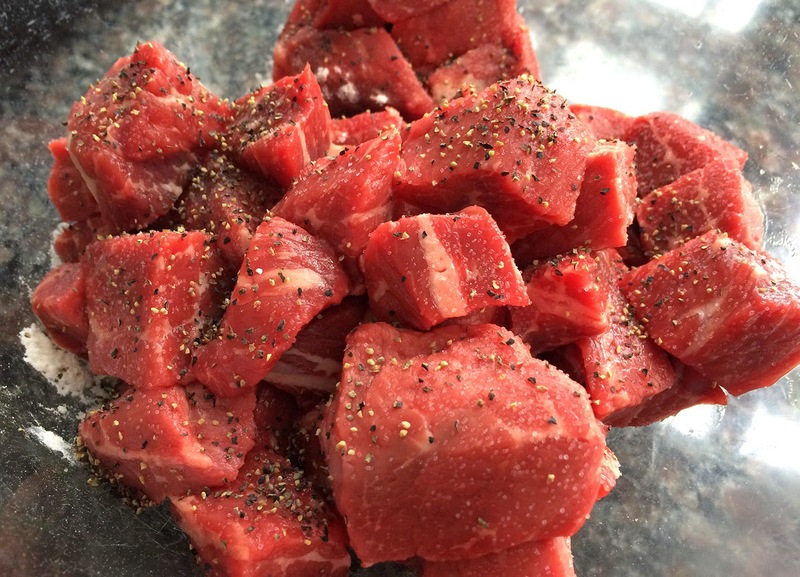 I like to purchase the packages of beef labeled "beef for stewing" at the grocery store because they're a perfect ratio of lean to fat that can withstand the ultra long cooking time...and they're already cut into chunks which makes my life a whole lot easier! I sprinkled the beef generously with salt and pepper, then gently stirred everything together so the flour could coat every crevice of the beef. I know flour seems a bit odd, but it actually helps the edges of the beef brown on the stove, while simultaneously acting as a thickening agent that can slowly be released in the Crock Pot. I heated a couple of tablespoons of olive oil over medium-high heat on the stove, then added the beef, along with 4 cloves of garlic, coarsely chopped. When I say coarse, I mean it! I'm talking cut each clove into 3-4 pieces. If you mince the garlic, it will burn within 2 minutes, and this beef needs to stay over the heat much longer than that! The garlic dissolves into the broth in the slow cooker anyway! Let the first side cook 2-3 minutes, until brown, then stir the beef around until all sides are evenly cooked, but the beef isn't necessarily cooked through in the center. It should take about 10 minutes or so. It's starting to smell GOOOOOD in my kitchen! Once the beef was mostly browned, I placed it on top of the veggies. Resist the urge to stir everything around right now because the vegetables are still rock hard and need to be closest to the heat source a.k.a. the base of the Crock Pot. And you want all the juicy drippings from the meat to seep into them! Now, return the skillet to the stove and reduce the heat to medium-low. You were expecting me to tell you to pour broth all over the ingredients and call it a day right? Nahh, I'm turning the flavor up a notch! Add the beef broth, Worcestershire sauce, soy sauce, mustard, brown sugar, dried rosemary, dried thyme, oregano, garlic powder and red pepper flakes to the saucepan. I'm making a stew base with TONS of flavor! After the mixture gets pretty warm, but not bubbling, take out a couple tablespoons and stir it into a small bowl filled with cornstarch. The cornstarch is a thickening agent, but will get lumpy if you just dump it into the hot saucepan as is; by whisking it with a small amount of hot broth first, you thin it out a little bit, thus preventing any unwanted lumpiness. Continue simmering the mixture for 3 more minutes until it thickens up some more, then pour it over the meat and veggies. It won't be thick like gravy at this point, just slightly thicker and lighter in color than the broth is on its own. 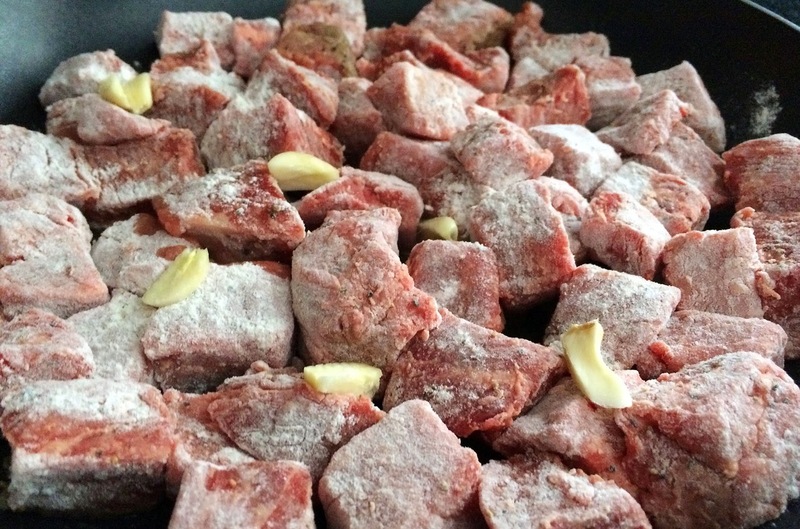 The starchy potatoes and flour-coated beef will thicken it more while it cooks! Now it's time to turn the heat on high, sit back, relax and forget about it for 5 hours. Well, maybe do a little test taste after 4 hours to see if the broth needs any extra flavoring, because we all buy different brands which means we all need different amounts of seasoning! Never take my recipes for cooking verbatum (baking, you gotta). I want you to have fun experimenting and adding the spices you like, not only what I like! Yeah, it's smelling super good. It's looking super good. It's tasting even better than it looks. I love Slow Cooker Sundays!!! Just like other cara membuat rawonfoods, red meat every day, especially beef is not recommended. Moreover, if we consume excessive portion, Risk seperto cholesterol, high blood pressure and stroke always haunt. Mereah meats such as beef, rich cara membuat martabak telorin iron, and a very good moment of growth. However, researchers believe that if the protein of beef, named Tau and beta-amyloidal, which accumulated can affect the performance of the brain, and interfere with brain cells that can lead to Alzheimer's. Red meat can not be separated from high cholesterol and fat, can lead to high risk of cardiovascular resep lasagna panggangdisease, which is a blockage in the blood salurah. But do not be afraid, as long as we are healthy digestion, digestive tract bacteria will break down fat and cholesterol than beef, which is named Carnite. Peanut Butter Banana "Ice Cream"